By joining SoACE, you and your organization can become a part of 15 state regional network of college and university career services administrators and employer representatives for networking; cultural and geographical development; professional development; best practices & trends; consulting services; diversity initiatives; branding opportunities and more! Read a message from the SoACE President, Wayne Hampton. 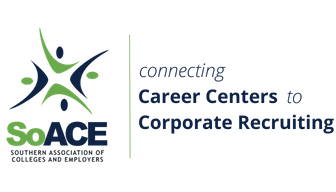 Registration is now open for the 2016 SoACE Employer Relations Summit. The Summit will take place at the University of Alabama at Birmingham, Alabama, June 15-17, 2016. Click here to register! SoACE Members can use the SoACE Kudos program to give a short word of thanks, encouragement or congratulations in our new e-newsletter, which will be published three times per year. Please use the kudos form to give someone a tweet-length (140 characters max) shout out and we'll publish it in an upcoming newsletter.